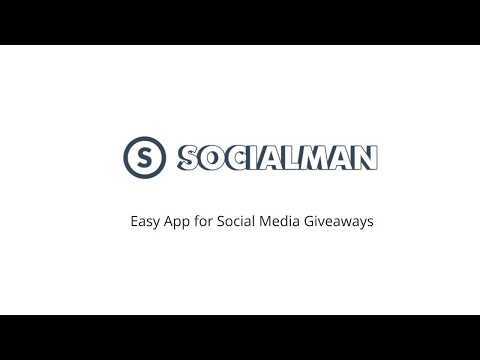 Socialman is a cloud-based marketing solution which allows users to create, manage, and run contests and giveaways across multiple social media channels. Campaign branding can be personalized with customizable header images and fonts, and multi-language support enables international targeting of contests. Giveaways can be run across Facebook, Twitter, YouTube, Twitch, Pinterest, and Vkontakte, and winner selection is automated, with users able to select whether winners are chosen randomly or by point majority. Socialman's analytics give users access to detailed statistics including entrants’ country, referral source, browser, URL, user information, and more. There are currently no reviews of Socialman. Multiple languages are supported, allowing international targeting of giveaways, and the dashboard is also available in several languages. Giveaways can be run across multiple social media channels, including Facebook, Twitter, YouTube, Twitch, Pinterest, and Vkontakte. Winner selection is automated by Socialman, with users able to select whether winners are chosen randomly or by point majority. Campaign and giveaway appearance can be personalized with customizable header images and fonts. Socialman's analytics give users insight into entrants’ country, referral source, browser, URL, user information, and more. Below are some frequently asked questions for Socialman. Q. What type of pricing plans does Socialman offer? Q. Who are the typical users of Socialman? Q. What languages does Socialman support? Q. Does Socialman support mobile devices? Q. Does Socialman offer an API? No, Socialman does not have an API available. Q. What other apps does Socialman integrate with? Q. What level of support does Socialman offer?